Dalit man beaten to death by 10 Muslim men in Barmer allegedly over love affair issue. A 22-year-old Hindu Dalit man was beaten to death in Ramsar police station area by fanatic Muslim group in Rajasthan, police said on Saturday. Mukesh Mathrani | HT Online | Barmer | July 21, 2018:: A 22-year-old Dalit man was beaten up to death in Ramsar police station area of Barmer district (in BJP ruled Rajasthan! ), police said on Saturday. The police suspect Khetaram Bheel, a resident of Bhinde ka Paar village in the district, was killed over a love affair with a Muslim woman. (In Pakistan and Bangladesh, the residual minority Hindus there, mostly Dalit and backward class people are still being tortured, killed, evicted, abducted, raped, converted, exploited, traumatized by the majority Muslims there. 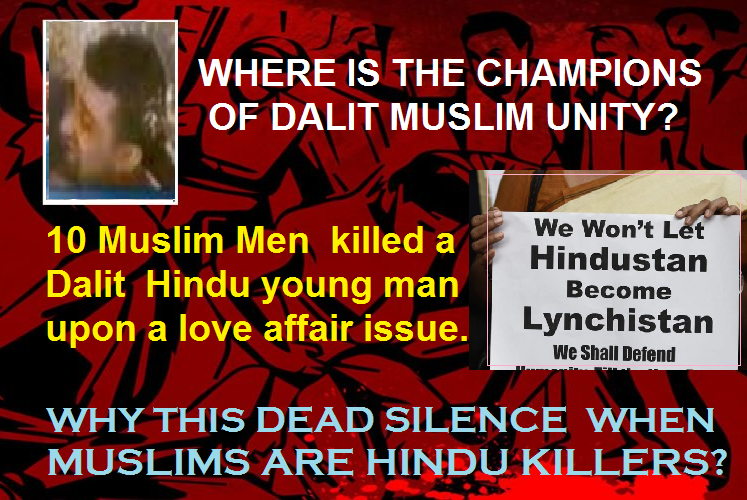 This is the reality of Dalit-Muslim unity in fact! Hindus face same reality in India, where they have turned minority. – Ed. Hindu Existence). Muslims have been Criminal quam for well over one millennium. Even now Muslims beat Hindus in terms of number crimes per capita population, say no.of Rapes,Murders,Dacoities committed / 1 Lakh population. If we call it CRIME RATE INDEX = CRI , Muslim CRI will be 20 times that of HINDU CRI. This entry was posted on July 21, 2018 by hinduexistence in Anti-Hindu, Attack upon Hindus, Attack upon Hindus by Muslims, Hindu Murder, Hindu Persecution, Islamic Aggression in Rajasthan, Islamic Conspiracy against Hindus, Islamic Menace, Jihad in Rajasthan, Muslim Aggression in Rajasthan, Muslim Conspiracy Against Hindus and tagged 10 Muslims lynched a Dalit man, BJP ruled Rajasthan, Dalit man beaten up to death, Fake Dalit Muslim Unity, Killing over over love affair issue, Muslims are Dalit Killers.